Becoming a new parent is exciting, but it’s also extremely tough. No matter how many books you’ve read, or how much advice you’ve gathered throughout your pregnancy, nothing can prepare you for the challenges ahead! It’s common for new parents to quickly find themselves run down, stressed and struggling to cope with the demands of their newborn. Lack of sleep, increased worry and simply not seeming to have anywhere near as many hours in the day as you need to get everything done, can leave you feeling exhausted, deflated and emotionally drained. Although it is common to feel like this, it doesn’t mean you have to just ride it out. There are a lot of techniques and methods to cope with the struggles of being a new parent and mindfulness is proving to be one of the most popular and effective methods around. Mindfulness is essentially learning to embrace the present moment. These days, life is spent at a constant hectic speed; especially when you become a parent. Without even realizing it, most of us are constantly thinking about and working towards the future. While this is completely natural and there’s certainly nothing wrong in looking and working towards the future, it’s also important to ensure you’re living in and appreciating the present moment. Being aware of your feelings and thoughts in the present is said to have awesome benefits on your mental wellbeing. Through mindfulness, you’ll learn how to reconnect with your body and control your thoughts and feelings. So, how exactly can this help with parenting? Perhaps the biggest benefit of learning mindfulness as a new parent, is the fact it can help you to really enjoy and appreciate the time with your baby. There’s a lot of challenges that come from being a new parent and you’re forced to quickly learn a lot of new skills such as changing diapers and swaddling. Many new parents end up spending so much time worrying about the responsibilities of parenthood that they simply don’t have the mental capacity to simply enjoy the moment with their little one. 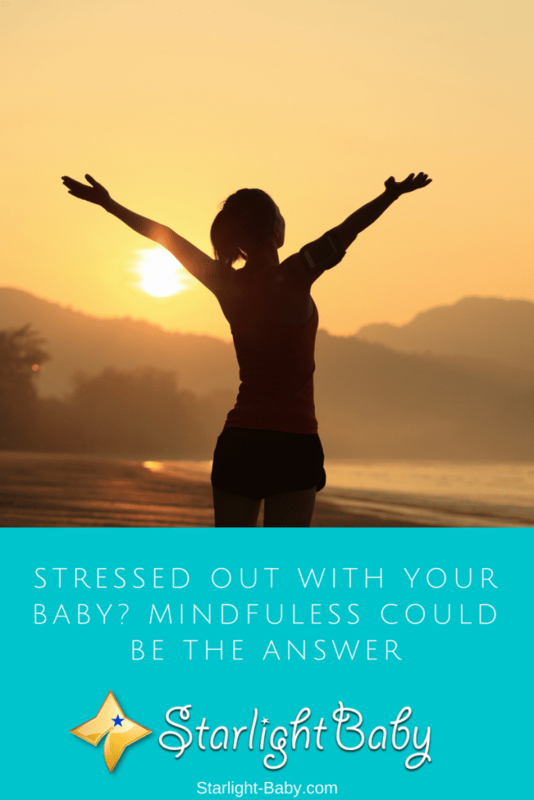 Mindfulness can also help you become calmer and happier which will also greatly benefit both you and baby. It significantly helps to lower stress levels too, which make parenthood much easier to cope with. So, now you know what mindfulness is and how it can help, the question is how can you put it into practice? Below you’ll discover some of the best mindfulness techniques for new parents to try out. It’s worth noting here that although many of them sound really simple, they’re actually pretty tough to put into practice. When your mind is so used to thinking and acting a certain way, it can be difficult to change it. However, the key is to practice and start to become more aware of your thoughts and feelings. The more frequently you follow the techniques below, the easier they will become. One of the first things you learn with mindfulness, is the benefit of long, slow, deep breathing. When you’re a new parent, it’s easy to get overwhelmed; especially when you’ve had very little sleep. The trouble is, the more overwhelmed you feel, the more stressed you become and it keeps a negative energy cycle going. Learning to just stop, close your eyes and breathe slowly is one of the simplest and quickest mindfulness techniques you can use to take control of the situation. Try and count to five, focusing solely on your breath. Follow it as the air travels through the mouth, down the chest and into the tummy. Then, follow it on the way back out of the body. This breathing technique won’t just lower your stress levels, it will also help to boost focus and concentration – something all new parents need in abundance! Sometimes, the reason new parents become overly stressed is because they have a certain expectation of what parenthood should be. They compare their baby to others and feel frustrated if the reality doesn’t measure up to the expectation. It’s actually quite normal to have expectations about parenthood and how babies should behave. This is especially true when you have well-meaning strangers, friends, colleagues and family telling you what to expect. However, what you need to realize is that each baby is different. This is your parenting journey and it isn’t going to be the same as everyone else’s. So, rather than stressing out that your little one is different, embrace that fact and adjust your parenting to suit them. Analyze your expectations and figure out whether they are realistic or whether they’re preventing you from really enjoying your new parenting experience. Mindful walking is a fantastic way to calm the mind when you’re trying to settle your baby. When you think about mindful walking, typically you might logically associate it with walking outdoors. However, you can participate in mindful walking absolutely anywhere – even your own home! The key is to focus on your breathing as mentioned in the first tip above. Then, as you walk, whether it be in the park or pacing your home, move the focus from your breath to your feet. Count the number of steps you’re taking, notice the way the floor feels and how your weight adjusts with each step. Start to identify any tense areas and then let that tension go. Walk slowly and continue focusing on the actual process, taking in as much detail as you possibly can. You’ll be amazed how much of a difference this can make to your mindset. By the time you’ve finished you might even realize baby is now sleeping and you feel completely relaxed. These are just three mindful parenting tips. It’s basically about calming the mind and focusing fully on the present. The effect it has on your wellbeing is astounding and it’s something you can take part in no matter where you are. Overall, it’s not easy being a new parent and one of the hardest things is learning how to relax. Mindfulness is a fantastic way to reduce stress and simply enjoy parenthood. It may take a little practice, but once you’ve got the hang of it you’ll find it easy to incorporate mindfulness into every aspect of your life. I can personally confirm that mindfulness is truly amazing for dealing with ANY sort of stress. When I first gave birth, the first months I was really stressed out and overwhelmed. Yes, the chaos we encounter everyday, as we struggle to balance time for the baby and housework, can really stress us out! I never tried yoga but has heard a lot of wonderful things about it. Good for you! I did spend a few minutes a day in silence when my kids were still babies. Some quite time. It worked, too. Now, I no longer have a lot of time for a quite time, but I do take a pause and would just stare at my kid’s face as he/she tells me about his/her day, and that would be enough to keep me going again. I absolutely agree with your opening line. I am a new parent, my baby is just three months old. My three months parenting experience tells me how demanding the work is. Sometimes I ask my dad and mom how did they raise four children when raising a single child is so difficult. They laugh and say, ” we took the harded job in the world.” How true is their statement. Parenting is the toughest job. I have used meditation tecnhique for relaxation. I have tried various meditation including mindful meditation. I understand it can be very useful to relieve from the stress related to parenting. I sometimes do mindful walking. It is a wonderful technique to relax your mind and body. We wouldn’t really know how difficult it is unless we’ve experience it. This is why I give my older boys some sort of a “lecture” once in a while about raising a family in the hope that they will remember it and be responsible adults. I want them to finish school first and get a job before settling down, so I keep telling them of the hardships – physically, financially and emotionally. I’m keeping my fingers crossed. Yes, your absolutely right. Being a parent is no simple task. So if your stress out and becoming weary then techniques in mindfulness are good for us. It can lessen our problems. Great blog! useful and helpful. You’re right , sephzer. It’s important to clear our mind from time to time to get rid of the stress, otherwise, we would lose our mind. Parenting is no easy task — it’s a 24-hour job with no pay and no rest days. It’s not a job that one can quit when things become too much to handle. It’s like buying a one way ticket, there’s no going back, haha. If only I have read this page 13 years ago it would have been a good help. But I still find it very important to appreciate these simple tips because I am able to try it out with my second child. Having a second child does not make you an expert in child care. In fact it is very much difficult for us the second time around since the gap is 13 years and we have to completely adjust. Take it from me time is so fast that parents get to focus more on the future later will you realize that you baby have grown up already and there is not much to tell because you don’t have much memories to share. Later will you appreciate the past and reminisce on how it was. New or old parent really doesn’t matter. It is a lot of responsibility. Mindfulness helps you relax and reduces the stress in you. Then will you come to appreciate the time you spend with your baby if parents too are stress free. You’re right, jojo. If we’re too stressed (either due to a job or house chores), we become irritable and unable to appreciate the small details about our child. These details are really important milestones in the child’s life, and for parents, too — first smile, first word… these are precious. Now you’re making me miss the wonderful things about a baby — the sound of a baby’s laughter when they’re tickled or saw something really funny in their eyes, the milky smell of its mouth, ah… those were the days. It can be that stressful for new nursing mothers that have never experienced what being a motherhood is like and that was the situation my aunt found herself last two months, her first kid is just 7 months ago, which prompted her to place a call to my mom explaining how raising a kid has been quite a tough period for her. She lamented that sometimes, she couldn’t enjoy her sleep anymore for the kid would keep disturbing her throughout the night and while I listened as my mom gave her tips on how to relax, I overheard mom telling her to always see the fun side in everything. I think being mindfulness would make one calmer and happier for you would be focused on what to do to ease the stress that comes with being a parent and no matter how we choose to look at it, it comes with a type of fun if mothers could embrace that in a way. I tried understanding what you meant by mindful walking, but I couldn’t fully get a hold of the point you were trying to pass across, would be happy if you lay some clarifications on what that is all about. Parenthood is big adjustment but with this tips mentioned it will help to make life easier. Everything is hard at beginning but once you get used to it, you’ll be fine. Mindfulness is setting your mindset to positive thinking, willingness to accept constant changes and learning as way of individual growth. Having a good positive mindfulness is beneficial to both mother and baby. Practice of living in positive life will be more productive and enjoyable.